Yesterday, the above photo was posted by a Hong Kong Nerf Facebook fan page. No word on it’s official pricing over there, and I’m wondering if it’s similar to the Canada Walmart price we saw about a week ago. This isn’t the first time that Facebook page has given us new info or had new blaster in that part of the world before. 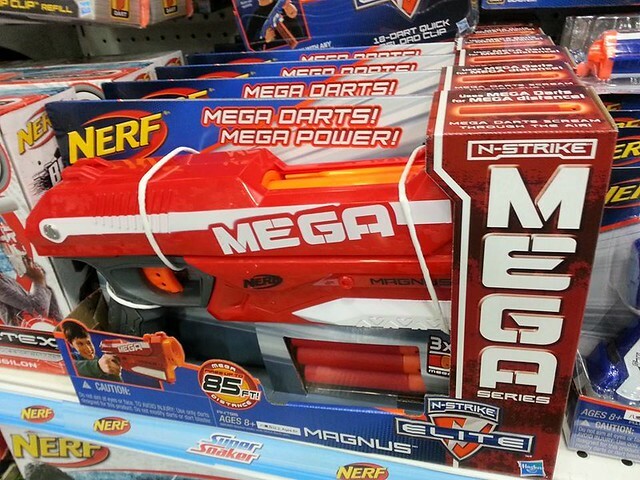 The USA, and possibly other countries, could see this blaster coming out this year due to it coming out over in Hong Kong at the moment. Again, I’ll keep you all updated as more info on this blaster comes out. 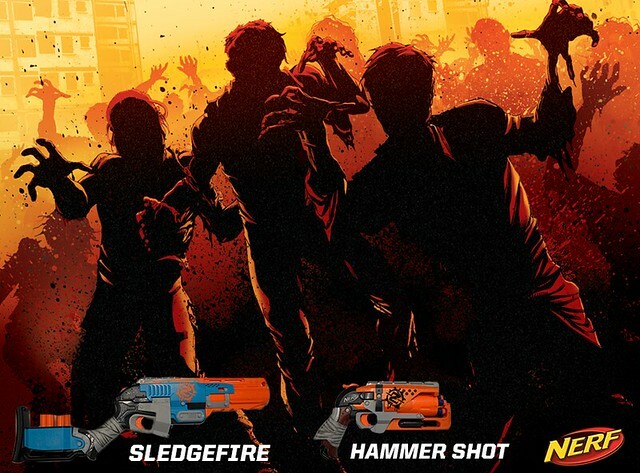 Earlier today, Nerf took to Facebook to sort of officially acknowledge the upcoming Zombie Strike line. The Sledgefire and Hammer Shot look a bit more darkly colored then the ones I linked in the post. According to Hasbro via MyLastDart, they used a darker shades of color in the photo above instead of the press released/Target site colors. Which colors are official is still under a bit of question, but it seems like they would use the newly updated colors on the photo, otherwise their isn’t too much reason to do that. Nerf finally acknowledges all those Amazon listings from about 2 weeks ago. Nerf Nation….are you ready for Multi-Shot Madness? We’re bringing you two new blasters in 2013 that allow you to fire TWO shots at once. Introducing the N-Strike Elite Rough Cut 2×4 blaster and the Vortex Diatron blaster. Each will fire two darts (Rough Cut 2×4 blaster) or discs (Diatron blaster) with every pull of the trigger, giving you twice the edge over the competition. Look for these blasters on shelves soon in 2013. (Please note: availability and timing will vary by country/state/city) Nation – let us know which multi-shot blaster you will be rockin’ in the new year! So the only question is, when will the Diatron be sent out for everyone in the USA/World to enjoy? All the other stuff previously listed or leaked is pretty much being released and out for public buying. Only time will tell I guess. Since the Stryfe is already out in the USA, does that mean we’ll get the Elite Rayven before the year ends? That paint job is super slick. Nerf finally has recognized and announced two of their upcoming N-Strike Elite blasters, and took to Facebook to announce so. Nation, today we are officially revealing two new N-Strike Elite blasters that will be hitting shelves in 2013 (please note: availability and launch timing will vary by country/state/city): the N-Strike Elite Strongarm blaster and the N-Strike Elite Firestrike blaster! The Strongarm blaster features a six dart revolving barrel and both rapid-fire and single shot capability, while the Firestrike blaster has a red light targeting beam built for precision. BOTH blasters will feature cool N-Strike Elite styling and long-distance performance. 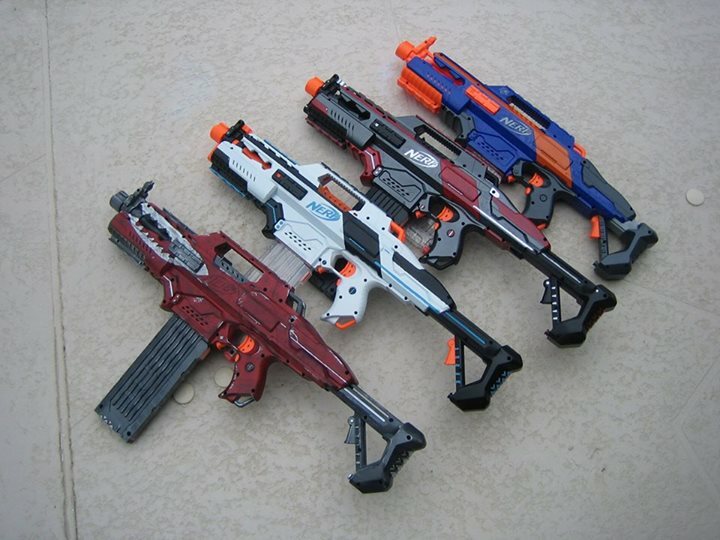 More details to come on additional Elite blasters headed to stores in 2013, so check back here next week! And it looks like we’ll be getting more news next week as well!